Since January, the Colby Foundation has spoken to medical students, faculty, and staff at five medical schools in four states as part of the Colby Cassani Endowed Lectureship Series (CCELS). These five schools are among seven that have been awarded the Colby Cassani Endowed Lectureship Series (CCELS), a full-spectrum learning experience, by the Colby Foundation. 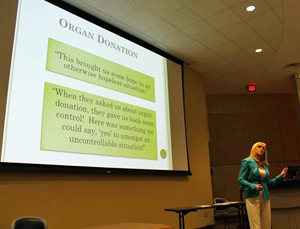 The CCELS not only includes speakers addressing donation and transplantation's clinical challenges, scientific developments, ethical issues, and regional logistics; but, it also features individuals sharing their personal journey as an organ donor, donor family, or transplant recipient.